Title: This is purely for your own use, and will be displayed in the main app page so that you know the difference between feeds. Blog Address: This is the URL where the blog is located. If you choose to change this, BlogFeeder will scan the new URL for posts. This is handy if your blog has been migrated to a new URL. If the new URL does not contain your old posts, they will not be deleted. However, they cannot be updated if changed. Feed to: This the Shopify blog that BlogFeeder will import posts into. If you change this location, old posts will remain where they are currently, but new posts will be imported into the new "Feed to" location. Previously imported posts that are updated will be ignored. Default Author: BlogFeeder tries to pull in feed authors from imported posts. However, if it can't find an author, it will assign the default author to the post instead. 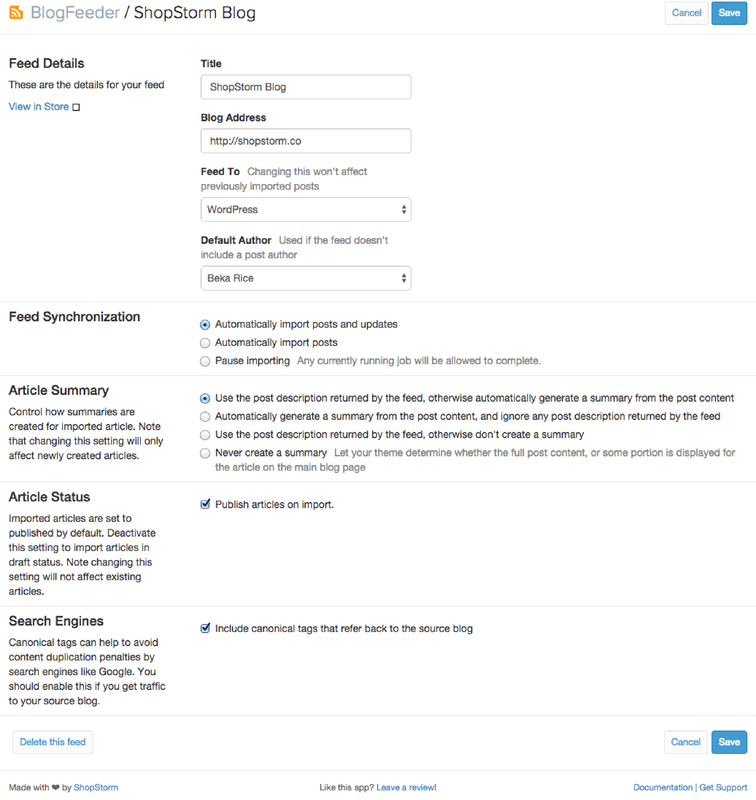 These settings adjust how BlogFeeder will treat this feed. If you allow it to, the app will periodically check (every 10-60 minutes) your blog for new posts and changes to old posts, then bring over any new or updated content. You can tell BlogFeeder to only look for new posts by enabling "Automatically import posts" (second option) instead, which will ignore changes to old posts. If you don't want BlogFeeder to search for changes and automatically import them, select "Pause importing". This will turn off automatic synchronization, but you will still be able to manually trigger synchronizations from the "Feeds" main page by clicking "Synchronize". This will control how an article summary, or excerpt, is generated for your post when imported. If you're not sure which setting is best for you, then we recommend checking out our guide on excerpts. Determine whether articles should be published or set as drafts for you to review when imported. You should enable canonical tag use unless you know what you're doing :). If you're not sure, leave this setting enabled! Enabling canonical tags will add information for Google and other search engines to tell them that the imported content originated at another blog. This ensures that your Shopify site is not penalized for having duplicate content. However, using canonical tags for imported content does not yield as great an SEO benefit as having original content does. If you plan on importing all posts, then hiding or redirecting your old blog, you can turn canonical tags off. Please note that we don't recommend deleting your old blog, as images are still hosted on that site! BlogFeeder cannot import your images, as Shopify doesn't allow image imports via their API. Turning off canonical tags will tell search engines that your Shopify blog is the original source for this content, which provides the largest SEO benefit. You can disallow robots on your old site or use 301 redirects from your old blog to your Shopify site if you plan on maintaining your old blog, but using Shopify as your original source for content. We do have a few helpful hints on how to hide or redirect your old blog. However, please note that we will not do this process for you as part of our support. This is simply a suggestion on how to get the most out of your content, and it not part of our app service. We recommend that someone on your team understand SEO, or you hire a Shopify expert to help with this if you'd like to hide your old content.